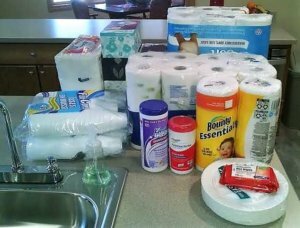 It was shopping day at Trillium House and we were just about to add some much needed items to our list. We quickly eliminated some of the list when the good folks from St. Mary’s Parish in Big Bay brought in a wonderful selection of items that we routinely use. The timing of this gift was perfect. Thanks to everyone that contributed to this donation. So many of these items we use in large quantities so if you happen to think of us when you’re shopping, we’d truly appreciate anything that you think we might use! Check our wish list if you have any questions. Once again thanks to our many donors and volunteers!